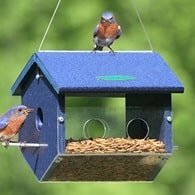 Attracting Bluebirds to watch their nesting and feeding habits can be done by placing birdhouses correctly, and, monitoring those birdhouses to prevent other species from using them. By providing the right types of food and cover for them to raise their young, you'll make your backyard more inviting and have a greater chance at attracting these beautiful birds. The following information is provided to help you understand the needs of bluebirds and how you can attract them to your backyard. Once declining in population, these birds are finally beginning to make a comeback. It's interesting to note, these birds were once as common as the American Robin. Numbers declined in part, from nest competition with House Sparrows and the European Starling, both introduced species. Loss of habitat is another factor. Through the efforts of birding groups, public education, and your help, these birds will have a better chance at survival than they once had. 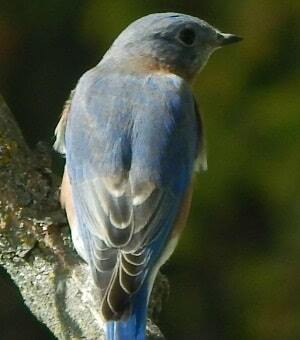 Eastern Bluebirds measure 6 1/2 inches in length. The male has bright blue upperparts, reddish breast, and white belly. The female has a buffy throat and breast, grayish-blue head and back with light blue wings and tail. Bluebirds can be found in rural gardens, orchards, and suburban gardens near open farmland. Their arrival in early spring is a sure sign that winter is on the way out. The breeding season for these birds begins in April and will go through July, although a couple of weeks on either side is possible. 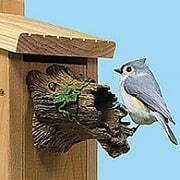 The fact that these birds are cavity nesters makes them ideal candidates for a birdhouse. 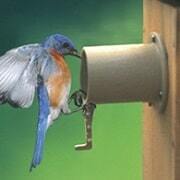 In fact, if there was ever a bird in need of our help in providing nest boxes, it is the Eastern Bluebird. The nest is made of grasses, plant stems, pine needles, and lined with hair, feathers, and fine grasses. The nest is placed in a birdhouse, or abandoned woodpecker hole usually 3-20 feet above ground. The female lays between 3-6 pale blue eggs. The female will incubate the eggs for 13 - 16 days and the young will leave the nest within 15 to 20 days. The male will often keep feeding the fledglings while the female begins a second nest. If you plan on putting up a bird house, place it on a pole within 5 - 6 feet off the ground. This will allow access for monitoring which should be done. 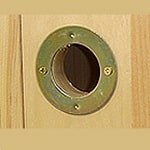 An entrance hole should be 1 1/2 inches in size. I can guarantee House Sparrows will be a problem and every attempt should be made to keep them out. Removing nest, trapping and any and all legal action should be taken. The better you control House Sparrows, the better your chances will be of attracting and hosting these birds near you. Bird Houses should be cleaned as soon as the young leave the nest. The young will not return but, within a couple of weeks, the adults may return for to start a second or third brood. Nest can harbor parasites that could harm the young nestlings. This cleaning after the first nesting doesn't have to be a major cleanup, save that for the end of the season. Just bag the nest and throw it away, then brush out the inside of the nest box and rehang. Now you're ready for more birds. When it comes to feeding, what Bluebirds eat is a large amounts of insects. Eighty percent of their diet comes from insects during spring and summer. In addition to insects, these birds eat berries and fruits off of small trees and shrubs. You may want to try placing dried fruit and/or chopped peanut kernels on a platform type feeder. There are other ways to lure these birds, the best of which is to offer them mealworms in a tray feeder. They are very fond of mealworms. You can offer live or dried mealworms. Place them in a tray feeder or a specially designed feeder (see right sidebar) so that other birds don't get to them before the Bluebirds. Providing mealworms in winter is a good idea. They are inexpensive and last a long time if kept in a refrigerator. American Robins, Gray Catbirds, and Mockingbirds may also be attracted to feeders containing the worms. Since the bluebirds are many places during winter, a Heated Birdbath can supply the open water they need to survive. Water is just as critical during cold weather as it is in summer. All life needs it year around. They also can be attracted to bird baths, particularly if the water is moving and makes splashing noises that they can hear at some distance. Note: Please Use The Contact Us Page For Questions From the top menu. Do you have a great story about Bluebirds nesting or feeding in your backyard? Have photos? Why Not Share it! Our Visitors will love reading and viewing your stories and pics. It's Easy. Just fill in the blanks below and upload your photos. Ready - Remember, 4 or More Full Paragraphs and at least 1 photo to Get Published. Remember, Your story will not be published without an original photo on topic. Here is where you upload your picture. Click the button and find it on your computer. Then select it. If you're having problems, try resizing your picture. 400x500 is best. My first Bluebirds & then Tragedy!! !